See it in Full Screen! You’re in for a real treat this winter solstice! You’ve been invited to stay in a 3D-modeled gingerbread house. Don’t hesitate – it’s fresh out of the oven! Use the arrow keys to walk around the scene, and look around by dragging the mouse or by pressing the w a s d keys. ENTER and SHIFT will allow you to move vertically. Above Jolly McFreeze's gingerbread house. Jolly McFreeze will greet you before you go in for the night. Don’t be alarmed if you see him looking around – he’s just admiring the snowflakes. A fireplace and a glowing gumdrop ceiling light will help to keep you relaxed during your visit. Inside Jolly McFreeze's gingerbread house. As night falls, keep your eyes peeled for a special message on the front of the house. Enjoy your stay! The “Happy Holidays” text was generated using the MyFont Exporter, using my Fun Font typeface. 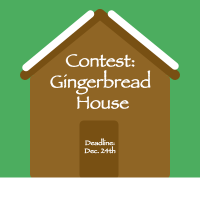 This project was a winning entry to Khan Academy’s Gingerbread House contest, which ran from December 2nd to 24th, 2016.